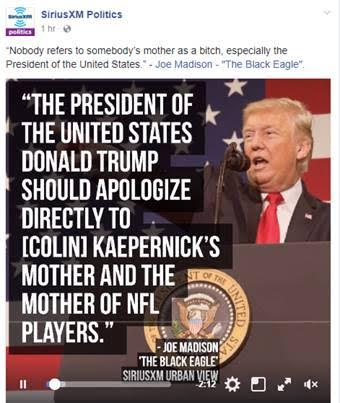 SiriusXM host, civil rights activist Joe Madison: "The President of the United States should apologize directly to [Colin] Kaepernick's mother and the mother of NFL players..
to the mother of all NFL players. And then let me add something that Sherry said. The mothers of NFL players ought to take a knee. They should form a protest. The mothers should take a knee. I’m very serious about this. This argument, well, is not about race. See, that’s what FOX is leaning with this morning. It’s not about race, that’s what they’re leaning with…But here’s my point. It is not about criticism of the NFL whether it’s about race or not.